Another month went by and as usual it is time to show how we managed to complete the monthly DB challenge. 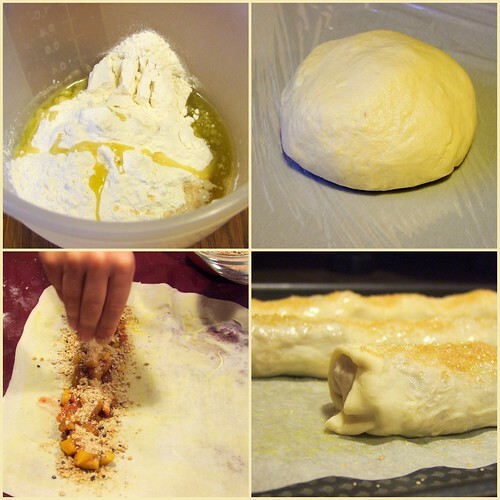 Strudel… I love strudels and I tried making strudel dough several times until now. The results were not as I would have liked so I always turned to store bought phylo. This time it was mandatory to get it right. I made this dough 3 times this month. The first time it was great – it was the dough I have been searching. I made mini tarts with lemon mousse and topped with cherry sauce. Some of the tart shells have been served as ice cream cones to the chidren and they loved them – that is how the second time appeared. My daughter wanted her ice cream only in phylo cups. As with the last few challenges this one also allowed millions of combinations and of course it was really difficult to make a decision. So, I made: peach mousse and cashew crumble mini tarts, mango and papaya strudel, cheese and cherry berry jam strudel and a few chocolate – biscotti triangles. After step 2 above, I divided the dough in 40 g balls. Roll two balls of dough as thin as you can. Brush the first one with melted butter and sprinkle the sugar/ pistachio mixture all over. Top with the second one. Using a cookie cutter, cut as many circles as you can and place them in well buttered muffin pans or mini tart pans. Bake them at 200 degrees Celsius for about 10-12 minutes until golden brown. Sprinkle the gelatin over cold water and let it bloom for about 10 minutes. In the meantime heat the peach puree and the sugar until the sugar is dissolved. Remove from the heat and add in the gelatin stirring until the gelatin is dissolved. Let it cool to room temperature. Add half of the whipped cream and gently incorporate it. Add the rest of the cream. Pipe the mousse inside the tart shells. In a food processor combine the first 4 ingredients and the cinnamon if using. Pulse until the nuts are as fine as you like them. Add the butter cut in cubes. Pulse until the butter is finely broken up and the mixture no longer looks sandy and is starting to stick and clump together. Refrigerate until ready to use. I usually freeze part of the crumble. Preheat the oven at 175 degrees Celsius. 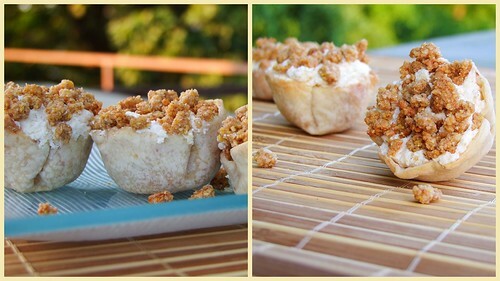 Spread part of the crumble in a pan covered with parchment paper and bake for 12-15 minutes. Let it cool completely and sprinkle over the tarts (as my tarts are very small, I dipped them in the crumble). Preheat the oven at 185 degrees Celsius. Mix the fruit, the sugar, the jam and the rum. Set aside. Crumble the biscotti in a food processor. Brush the dough with the butter. Sprinkle some biscotti crumbles on one side (leave about 1.5 cm on top and on the bottom). Spoon the fruit mix over the crumbles and top with the rest of the crumbles. Fold the upper and bottom edges over the filling. 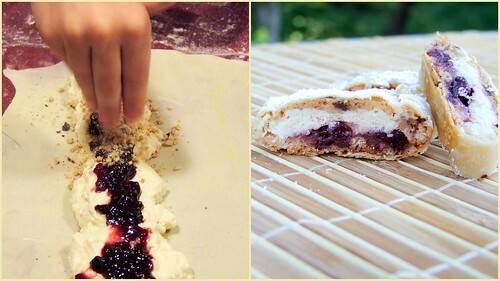 Fold the closer edge over the filling as well and start rolling the strudel as a jelly roll using the cloth underneath. Place the strudel on the baking pan lined with parchment paper. Brush more butter on top and sprinkle some brown sugar. 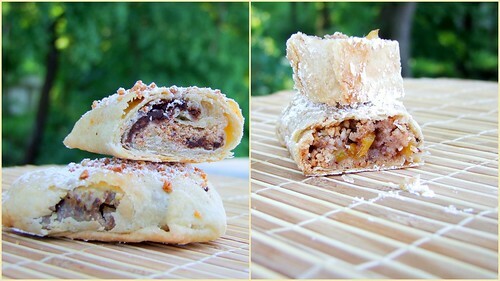 Bake the strudel for about 30-40 minutes until golden brown. Roll another ball of dough. Brush with melted butter. Fold it in 2 lengthwise. Place chocolate and biscotti at about 1.5 cm from the top and start folding the dough. Check this post for great pictured instructions. Brush the top with melted butter. Sprinkle sugar, or crumble on top and bake as above. Place the curd and the sugar in a clean bowl and beat them until smooth. Add the egg and beat until well blended. Scrape the vanilla bean and mix everything. Proceed as for the above roll: butter, then crumbles, them cheese mixture, jam and finish with another sprinkle of crumled biscotti. I <3 how you made tarts with the dough. Also the cheese, cherry strudel is all kinds of yumminess! What a lovely job you did on this challenge! And so many too – wow 🙂 I’m impressed. Dumnezeule!!! A meritat asteptarea!! Arata minunat! Si sunt f interesante umpluturile!!! FELICITARIILE MELE! Sunt la dieta dar vreau si eu!